A Bury Market butcher's business is enjoying the sweet taste of success after winning a national award for the quality of its food. 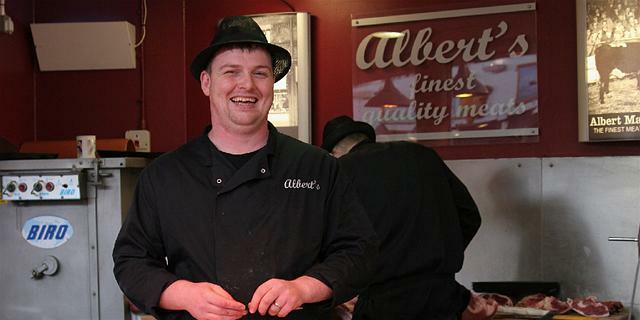 Albert Matthews Butchers impressed the judges of Great Taste 2014, the world's largest blind-tasted food awards. Three of the company's products - its rare breed pork loin joint, rib of beef and salt brisket - are now able to display the gold and black Great Taste logo. The awards are judged by more than 400 palates belonging to food critics, chefs, members of the Women's Institute and farmers. Chris Matthews, director of Albert Matthews Butchers, said: "This is another milestone for us as we have now have more than 20 Great Taste awards for our meat products. That's not bad going for a small butcher located on Bury Market, considering that the awards are renowned for being difficult to win and have been christened as the "Oscars of the food industry". "The awards have been a great help in getting the business recognition through the quality of our products. We really try to champion the produce of Lancashire at our stall and online at our website: Albert Matthews butchers. We've also found we are supplying more and more pubs, restaurants and hotels in the area that are looking for great quality, locally sourced meat and poultry." The company, based on Bury Market since 1982, has just become the third butcher in the UK to install a Himalayan salt ageing chamber, which is used to help improve the dry aging process of its meat. Chris added: "This is the first time the people and catering establishments of Greater Manchester have been able to buy salt-aged steaks and it is definitely creating a stir, with three of the restaurants we supply already using them and our customers raving about them. We can't wait for next year when we can enter them into the 2015 awards." Some 10,000 products from across the country were entered in this year's Great Taste awards. Among the judges were Masterchef judge and restaurant critic Charles Champion, BBC Food Programme presenter Sheila Dillon, Great British Bake Off winner Frances Quinn, and MasterChef 2013 Natalie Coleman. There were also food buyers from Harrods, Fortnum & Mason, Selfridges, Harvey Nichols and Whole Food Markets, and chefs including Michelin Star chef Russell Brown.